"A giant cash register, with coeds holding the figures in the windows at the top, was erected in front of Bovard Hall, in 1923, when USC sought $10 million for endowment. Only $71,350.00 had been subscribed by March 3, 1923 and the campaign ended far short of its goal" -- clipping attached to the verso. 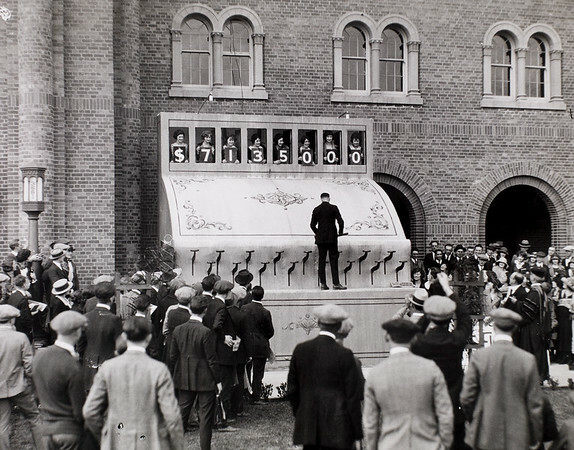 "A giant cash register, elected on the lawn in front of the Administration Building, was a device of the first major fund-raising drive of the Von KleinSmid administration in 1923. Women students held the figures in the windows at the top of the register, changing them in response to the man hammering the keys with a sledge. Drive sought $10 million but ended far short of the goal" -- The Trojan gallery, p. 87.